The closing date for entries is Friday, 29 February 2008 and this will be strictly applied. Commercially Machine Quilted Quilts – this popular category has been split into two categories, amateur and professional, based on the status of the quiltmaker. The prize is only awarded to the quiltmaker entrant but your quilter will receive acknowledgment, a rosette and a certificate. If you are an amateur and your quilt has been commercially quilted, you should enter Category 5. If you are a professional and your quilt has been quilted by another person, you may either enter your quilt in Category 11 in your own name or enter another professional category in your joint names. Pictorial Quilts – the definition for Category 14 has been expanded to clarify that quilts must be representation of a person, place or thing. Domestic Machine Quilted Quilts – this category has been deleted due to lack of participation. However, the overarching special award of Excellence in Domestic Machine Quilting continues and you may nominate your quilt for this award by ticking the relevant box on the entry form. There is also an encouragement award for domestic machine quilting. Machine Embroidered Quilts – a new category 16 has been introduced on a trial basis. See the entry form for details. In addition, there will be a new special award for Excellence in Long Arm Quilting. As special awards are given to individual entrants, quilts entered into Categories 5 and 11 are NOT eligible for this award. Detailed conditions of entry are set out in the entry form. Please ensure that your category and quilt size are correct when planning your entry. Use clear handwriting when completing your entry form and keep to the 40-word limit for your quilt description. Don’t leave it to the last minute to post your entry form to the office. Remember, you don’t have to be a star quilter – the Guild welcomes entries from the full spectrum of its membership from beginners to experienced quilters and from traditional to contemporary designs. Start planning your entry today! the new quilt 2008 exhibition of 28 contemporary quilt textiles, presented by the Manly Art Gallery & Museum in partnership with the Guild, opens today. Manly Art Gallery & Museum, West Esplanade, Manly. Open Tuesday – Sunday 10am – 5pm. screenprint, cotton, veil, satin binding, 200cm x 140cm. A full colour catalogue, sponsored by Pfaff, will accompany the exhibition. You can also view a selection of the works on the gallery's website. The 2008 showcase program commences on 1 February at 10am with a presentation by award winning textile artist, Kay Haerland. The theme is "My Place". There will be 30 works from each country (Australia, NZ and South Africa) and these will be selected from entries received. Finished entries are due 15 July 2008. Entries must be 50 cm square (finished). They may be any kind of fibre art. The size has been chosen so the quilts can be stacked for ease of international freight. Each artist should provide a photograph of themselves, a 75-word statement that describes the inspiration for their piece and a release allowing the piece to be photographed and shown at various venues around the world. The travelling exhibition will premier at the South African National Quilt Festival 2008 before touring venues in South Africa, Australia and New Zealand - and possibly elsewhere for at least 2 years. The quilts will be displayed at Taia Textile Gallery, Wellington during Symposium 2009. Each piece should be sturdy enough to be stacked and freighted. repeatedly. Pieces with significant three-dimensional features, pieces that require special hanging apparatus, or pieces that are delicate and require special handling are not suitable for this exhibit. * The South African coordinator is Jeanette Botha and the New Zealand coordinator is Anne Scott. cnr Congressional Drive & Hume Hwy, Liverpool. Jo Binkhorst, “Boat” (detail), from Odyssey One, 2001. Gerada Baremans, “A New Beginning” (detail), from Odyssey Two, 2002. Attention Long Arm Machine Quilters! 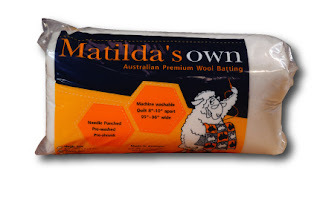 Thanks to generous sponsorship from Matilda's Own, who is providing a prize of $1000 in value of wadding products, a new Excellence in Long Arm Machine Quilting Award will be introduced for the Sydney Quilt Show 2008. The Quilters Guild of NSW Inc, in partnership with Manly Art Gallery & Museum, presents an exhibition of 28 contemporary quilt textiles from 25 January – 24 February 2008. Manly Art Gallery & Museum,West Esplanade, Manly. the new quilt 2008 is the 12th such collaboration between Manly Art Gallery & Museum and The Quilters' Guild of NSW Inc and comprises 28 works which represent the innovation and diversity of quilt textile making today. Works in the exhibition must meet the conventions of quilt-making (mostly of fibre and consist of at least two distinct layers stitched together). Using a dynamic range of materials and techniques the artists present diverse subject matter ranging from urbanisation, the environment, travel, families, illness and friendships to language and politics. A full colour catalogue will accompany the exhibition. contemporary quilt textiles and Judy McDermott- Speaking for Themselves. Dr Annette Gero is an independent curator and an expert on quilts. She has written numerous articles and is known throughout the world as The Quilt Lady. Dr Gero's passion is for old quilts, the stories behind them and the origin of quilting as we know it now. Dr Gero's collection of old and antique quilts is recognised as an Australian national treasure.